Thispost should conclude my day 1 pictures. 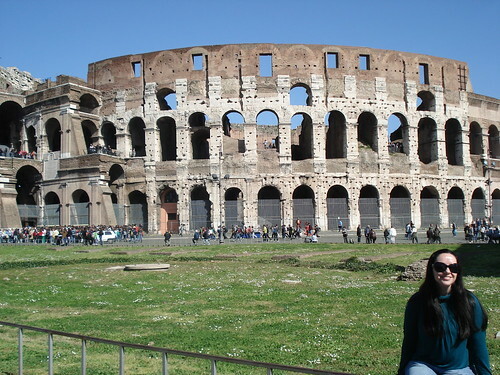 What trip to Rome would be complete without a visit to the Colloseum?! Of course, we went there. 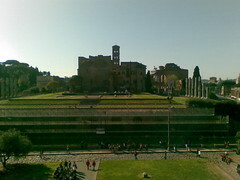 The picture above was taken from the Palentine Hill looking back towards it. 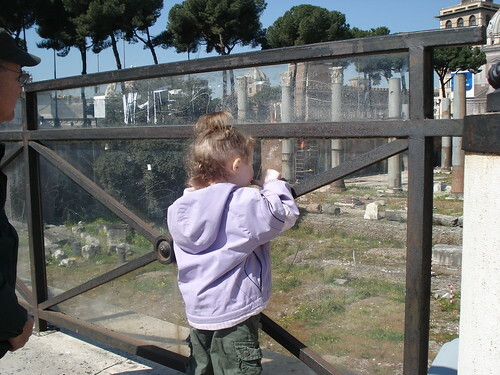 To get into the Colloseum, we had to pass through security. The line wasn’t too bad…Lydia helpedus through like she does many places. 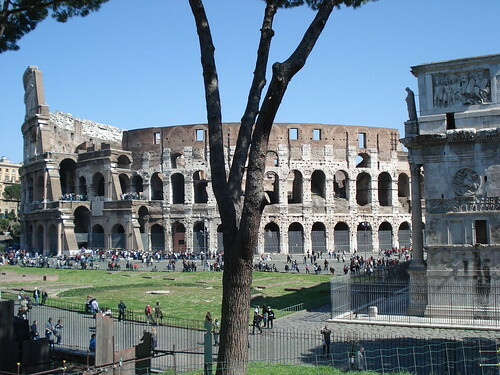 By the way, if you ever want to know, the ticket for the Colloseum is also good at the Palentine Hill. But, you can buy the ticket either place. According to Frommers, the line is shorter at the Palentine Hill. 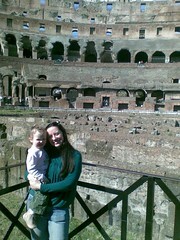 We actually went their first, exited, went to the Colloseum, then went back to the Forum. 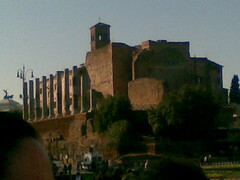 You need to take note that the order we did this in isn’t really supposed to work…we shouldn’t have been alloweb back into the Palentine Hill/Forum area…but the lady let us in. 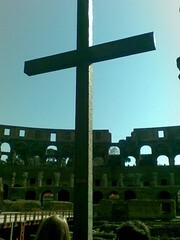 This was a cross erected by some pope in memory of Christians that were martyred at the Colloseum. 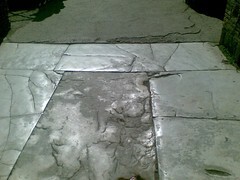 This marble looked really really old so I took a picture of it. 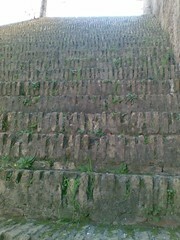 Here are some steps. 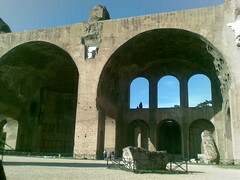 Historians think that people could enter and leave the Colloseum in 10-15 minutes. That is just amazing. 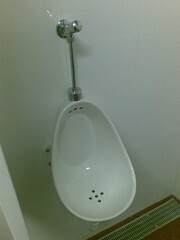 I wonder if Caesar ever used this?? 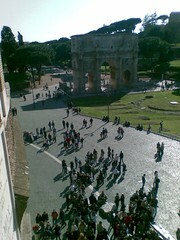 We had some great views from the Colloseum. 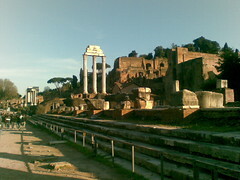 On the left is looking out over a hill where a temple of jupiter (?? or venus) once stood. Now, there is a church built on the spot where people still go to get married. 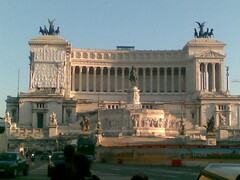 While walking around Rome, we saw this building several times. I don’t know what it is…but is is pretty impressive. If you have any ideas, leave us a comment. After the Colloseum, we went back to the Palentine Hill (see the warning above about use of the ticket) and went throught he Forum. Below are 4 pictures from there that I thought you might enjoy. There were a few things that struck me. 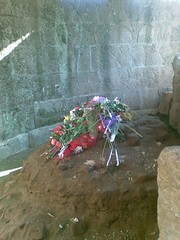 But the biggest was the flowers at the grave of Juluis Caesar (sp??). 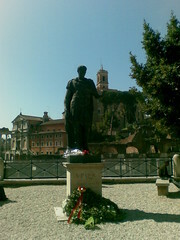 Why would people lay flowers at the grave of the man who destroyed the representative goverment and set up theall powerfull emperor? I just don’t understand it. 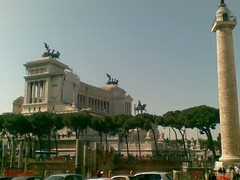 There are statues of other emperors around town. As you can see, they get flowers too. 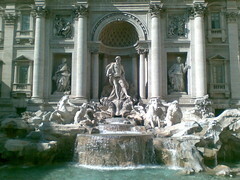 We also went by the Trevi Fountain (no, we haven’t thrown any money in. I may give them 5 or 2 dinars before we leave through). The last place I’ll write about was one of the first we visted. It was the Mamertine Jail where Paul and Peter were supposedly in jail. I don’t know how much stock I’ll put in it…but the jail was representative of a jail of that time period. I can’t imagine being in jail then. 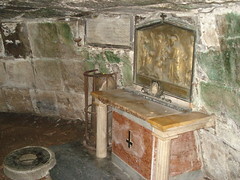 Note the upside down cross on the memorial in the cell. It is like that because Peter was crucified upside down. We went down stairs to get there…in old times, there was only a hole in the roof. 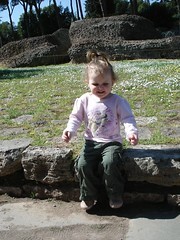 Today we visited the ruins at Pompeii. I’m uploading pictures right now. Check them out at our flickr page. I’m going to conclude the day 1 picture posts this evening too. 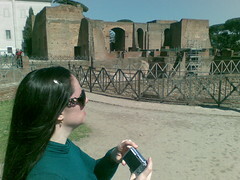 We went to the train station and got tickets for Naples and Pompei. We also went to the St. Angel Castle and the Parthenon. [Update 03-26-2009 21:56:01] I missed a day. Pompeii was actually day 4. Lydia has been such a trooper. Sometimes she rides around in her stroller while other times she walks. We usually let her walk as long as their aren’t many people or we are in lots of traffic. She likes that. But even when she has to ride, she doesn’t mind that either. 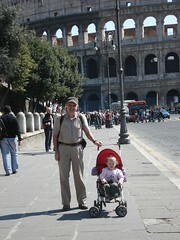 Lydia has had a great time getting pushed around by her grandparents and carried by them, etc… The picture on the right is Lydia and her grandpa in front of the Colloseum. 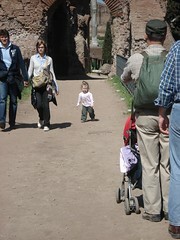 The pictures on the left and below is Lydia walking on the Palatine Hill. 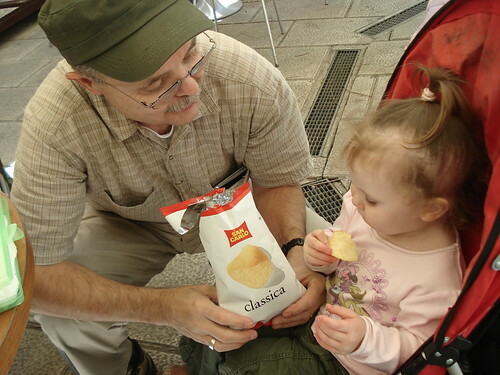 Speaking of time with her grandpa, Lydia has gotten to share some good food with her grandpa. Their favorite is…guess…potato chips. They both like them…lots! 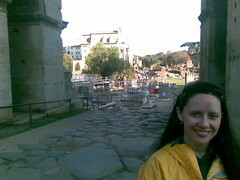 I’ll end with two more pictures of Lydia on day 1 in Rome. 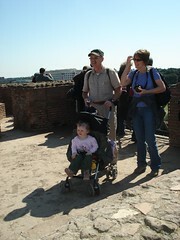 She’s with her grandparents on the left and resting on the Palatine Hill on the left. Just in case you don’t know…that is Cyndi (with her nice straight European hair…tell her you like it in a comment). Her friend Jelena worked for about 4 hours on straightening her hair, and making it all the same color. We’ll finish this off with Cyndi on either end of the Forum. 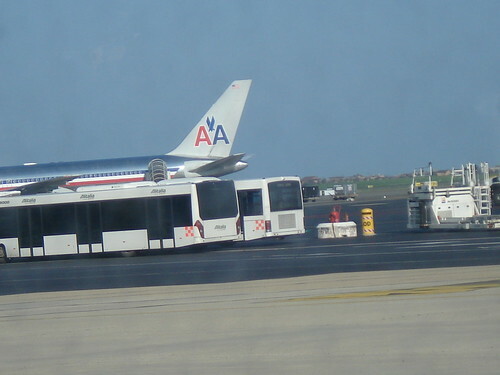 While we were taxing into the airport when we landed, we saw this view. That reminded Lydia about her grandpa sowe took a picture for him. 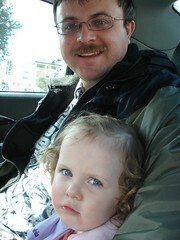 I went out for a walk while Cyndi and Lydia laid down for a nap. Here are some of the sights I saw. 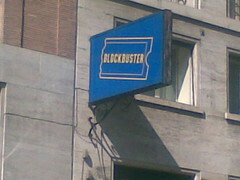 This isn’t too interesting, but I saw a Blockbuster…so I took a picture of it. I know it isn’t anything special…but I haven’t seen one in about a year. 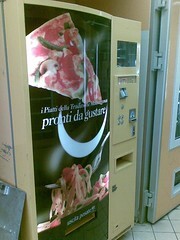 Only in Italy would you see a pizza vending machine. I forget how much it was…but I’d never seen one before. I saw a thing for RomaNBike. I took a picture, but didn’t do any looking for it. it may be a bike rental place or it may be something totally different. I’m not sure. 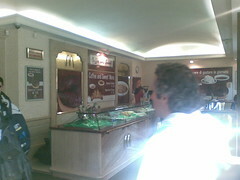 I stepped into a mcDonalds. Most of the others I have been in look like a McDonalds. This one didn’t so I snapped the picture. Sorry for the goofy whiteout. I was trying to be low key and not look like I was taking a picture.It had seperate stands. One place to order coffee and donuts. Another for ice cream. I never did see the place you order hamburgers…but I’m sure it was there. I didn’t walk all the way through since I had no intention of ordering. 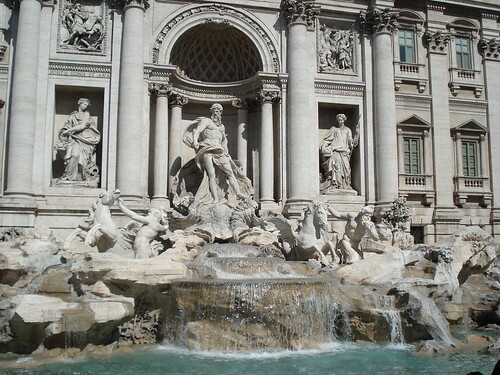 Below are a few of the pictures I took of the Trevi Fountain. We went a few days ago and I took a few more pictures. Check back when I get Day 1 pictures up for a few more. That concludes day 0 commentary on my pictures. 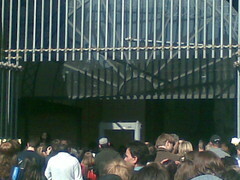 Check out our flickr archive for 22 March 2009 to see all of the pictures we took on that day. Why day 0? Well, this was our travel day. 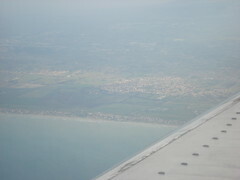 We flew from Belgrade to Rome and arrived around 8:30am or so. 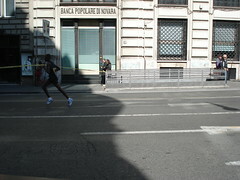 While trying to get to the place we are staying, we were thwarted by the Rome Marathon. Everything in the center was closed. We ended up and had to walk the last 1.5 km or so. 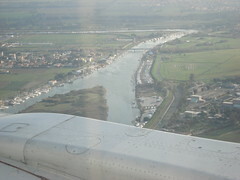 Here are some pictures we took while we were traveling to Belgrade and flying into Rome. Lydia did great on the plane. 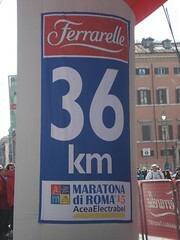 Speaking of the marathon, here are some pictures we took of that. 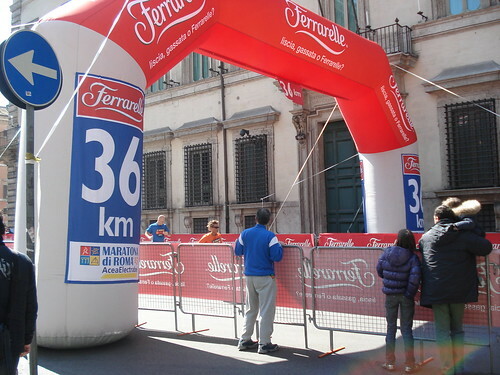 At first, we wondered where the runners were…but then we realized we had just seen the very first part of the race. Kevin…you should come over and run in this race. 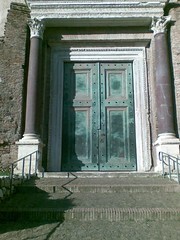 They go by some very historic stuff all over Rome. 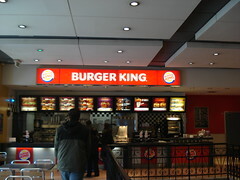 We ended up and ate at the best fast food place in the world…BURGER KING!! I had this thing called an Angry Whopper. 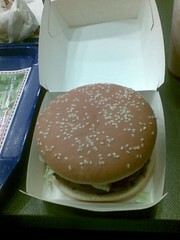 It was a whopper with spicy cheese and jalapenos on it. Lydia had a kid’s meal. I forget what Cyndi had. 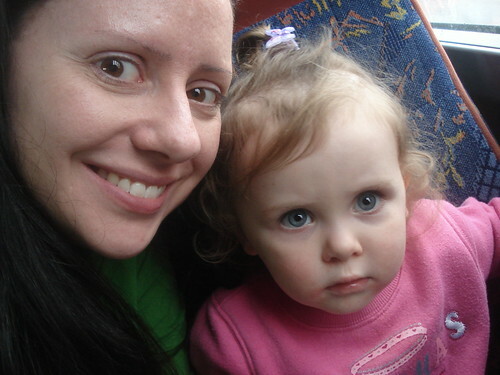 Lydia and I were tired after the long ride (and walk) to the hotel bed and breakfast place. Well, check back later…I’ll write more later tonight or tomorrow. For the grandparents, I thought I would feature this picture of Lydia. 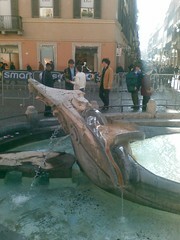 For more pictures of our day 1 in Rome, check back later. [Update 03-24-2009 20:24:46] Here’s a link to pictures from today. 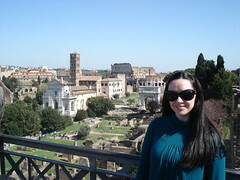 Cyndi, Lydia, and I have journeyed to Rome for a weeks vacation. I won’t have time to blog about everything…but I’ll try to keep everyone up to date. We’ll have to organize pictures…but you can check out our flickr page to see them until then. 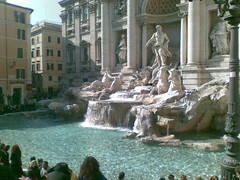 [Update 03-24-2009 20:22:21] Here is a link to pictures we took on our travel day (22 March) and our first full day in Rome.